Harvard Pilgrim Health Care officials said they saw claims from UMass Memorial nearly triple in 2009 to 2,922, costing the health plan $1.5 million and prompting it to negotiate “a significantly discounted rate for this testing,’’ which went into effect last January. This year Harvard Pilgrim estimates that claims from the hospital for bone marrow testing will balloon to 9,621 by the end of this year. Blue Cross Blue Shield of Massachusetts said it also began tracking the growth in claims and the above-average price about a year ago and is in discussions with UMass Memorial about the issue. The hospital “has assured us they plan to address our affordability concerns, and we are expecting a prompt resolution,’’ spokeswoman Tara Murray said. Tufts Health Plan said it is conducting an internal review of this issue. The vigorous recruitment strategy by the hospital, which oversees the Caitlin Raymond International Registry for bone marrow donors, came to light this week when New Hampshire’s attorney general, Michael Delaney, launched an investigation into the practices. Ted Gatsas, mayor of Manchester, N.H., alerted authorities when the city’s health insurance plan was hit with hefty bills for tests on city employees, about $4,300 per person. The office of Massachusetts’ attorney general Martha Coakley said it is also “reviewing allegations in the case,’’ but declined to be more specific. UMass Memorial, the teaching hospital for the University of Massachusetts Medical School, has suspended recruitment in New Hampshire and stopped using models, the hospital said in a statement. “We are cooperating with the New Hampshire and Massachusetts attorneys general offices and are confident that we will be able to address and satisfy their concerns,’’ the statement said. Nationally, most hospitals and other donor-recruitment organizations do not charge for the testing, said Michael Boo, chief strategy officer for the National Marrow Donor Program. The test typically involves a DNA analysis to determine whether the donor is a match for anyone on the bone marrow transplant waiting list. But in New Hampshire, UMass Memorial charges self-insured employers, like the city of Manchester, that do not have a negotiated rate upwards of $4,000 per person for testing. It generally has charged insurers like Blue Cross and Harvard Pilgrim $700 to $1,500 person for testing, said James Boffetti, senior assistant attorney general in New Hampshire and chief of the consumer protection bureau. UMass would not comment beyond the written statement. Boffetti said most people in New Hampshire who signed up to be donors have not been charged by UMass Memorial, even if they had insurance copayments or deductibles. Investigators and insurance executives said that while it is important to have a large pool of potential donors so that sick patients, many with cancer, can find matches, they question whether people who sign up at a sports event or a mall, lured by a flirtatious model, are fully prepared to go through with the transplant procedure if asked. In most cases, donors undergo a nonsurgical outpatient procedure that involves taking cells from the blood, but in some cases, donation requires a surgical procedure in the hospital to obtain bone marrow. The Caitlin Raymond registry is a nonprofit organization and a subsidiary of UMass Memorial Health Care Inc. Boffetti said UMass Memorial paid a Boston-area modeling agency $40,000 to $50,000 a week for models to work in dozens of malls and at special events. When passersby expressed interest in becoming potential donors, the model would direct them to a registry employee who would provide information about the program, explain the consent form, take their insurance information, and swab the inside of their cheek for a DNA sample. 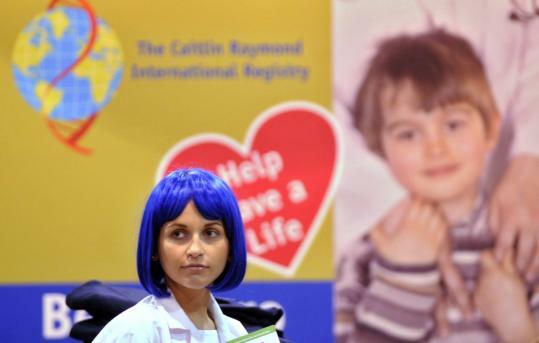 The Caitlin Raymond registry’s donors are included in the National Marrow Donor Program registry, Boo said. A red flag would be if potential donors recruited by the UMass Memorial program say no more often than the national average when asked to undergo the procedure. So far, Boo said, the refusal rate has not stood out.